The couple realized that they needed to adapt to the scenario, so they shifted strategies by focusing on the middle to high-end markets to move away from China’s pricing. Using their existing assets of specialized machinery and skilled metal workers, the Jiaos’ proceeded to enter the home furnishings sector. Segolene Aeyi-Fabie’s À côté tables (top right) and lamps (above left); Schema’s award-winning table by Celia Jiao. In time, Jerry and Celia were able to develop an intricate metal weaving style that defined their home furnishings and accessories label, Schema, established in 2013. Strong narratives, conceptualized by Celia herself or in collaboration with other designers, gave the brand its soul. “We need other ideas,” admitted Jerry, “but the foundation will always be the technique. And we will stick to that style.” Through the years, both foreign and local designers have participated in projects, with Celia safeguarding the Schema brand by providing inputs from the manufacturing side. This proved to be a successful arrangement with designers enriching Schema’s vocabulary without diluting its singular style. 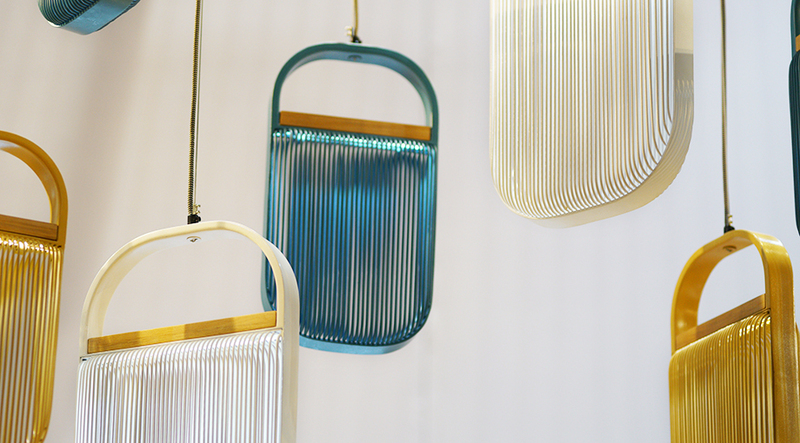 Flume hanging lamps by Stanley Ruiz and Celia Jiao. Schema’s portfolio reveals a stellar line up, starting with French-Swiss designer Segolene Aeyi-Fabie evoking an intimate atmosphere with a collection of furniture and lightings called À côté , a French term that means nearby. Thai creative Anon Pairot takes you to far-flung galaxies with his Zatellite hanging lamps. Filipino taste-maker Buji Layug draws from familiar basketry for a line titled Espalda. At Manila FAME’s 68th edition, Jerry (Schema’s CEO) and Celia, together with their sons, Jego and Jerby, unveiled their new collections. Celia collaborated with Stanley Ruiz for two new lines. It includes a series of drop lights called Compact, which means tight, to convey coziness, as well Flume, a family of lamps emitting soft radiance from discreet openings. Celia added a barstool to	her own Lilou collection.